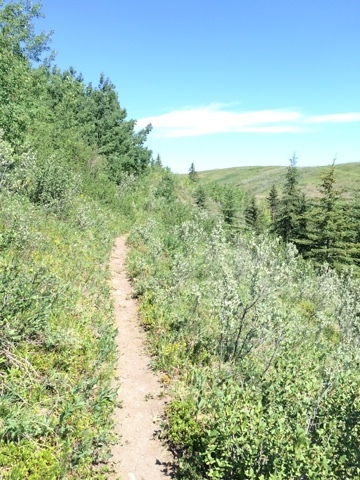 On the hottest day of the summer thus far, we headed down the path into the Twelve Mile Coulee. The Coulee is named for being 12 miles from Fort Calgary, on the NW stage coach line to Cochrane, and is now bordered by suburban homes. Once you step onto the path however, you quickly leave behind the suburbs, and step into a mixture of prairie and forested landscape. 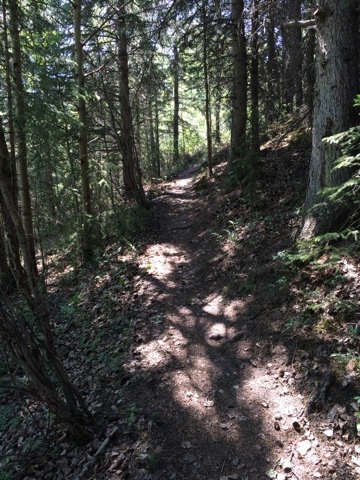 The trails are natural, not made by the Parks department, and have most likely been traveled for thousands of years by the people and animals who lived here. It is a wonderful feeling, when all around us in Calgary is so 'new'. 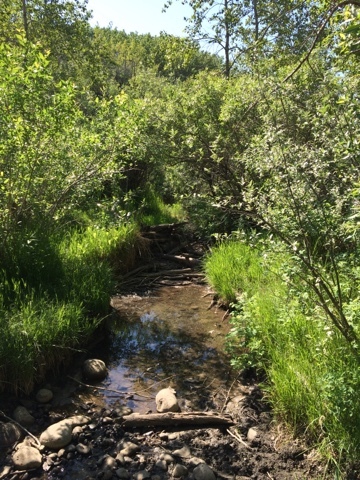 The creek runs fast in the early spring, but now is partially dried up. We had no trouble crossing back and forth, sometimes on stepping stones, sometimes through the dried bed itself. 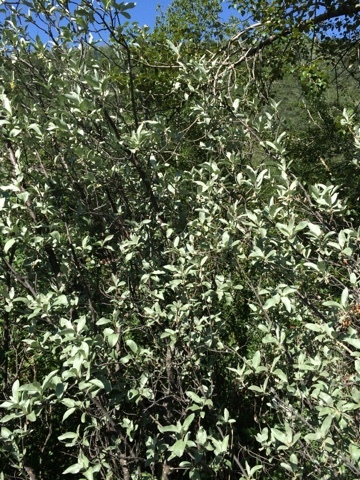 The trail along the top of the valley is beautiful, with all kinds of bushes and wild flowers along the way. We headed for shade as much as possible on this 30 C morning. Next time maybe start earlier! 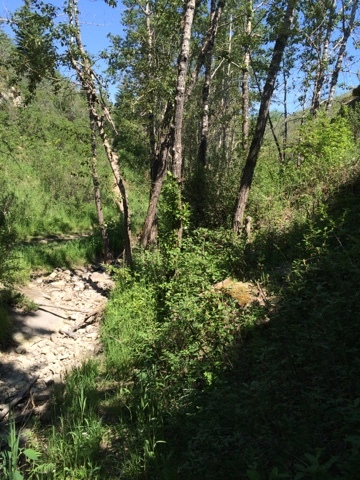 There are even more kinds of bushes and wildflowers in the shady bottom of the coulee. It is amazing to see the shade loving plants versus the sun lovers. Of all the city walks I have been on, this one has the most variety by far. 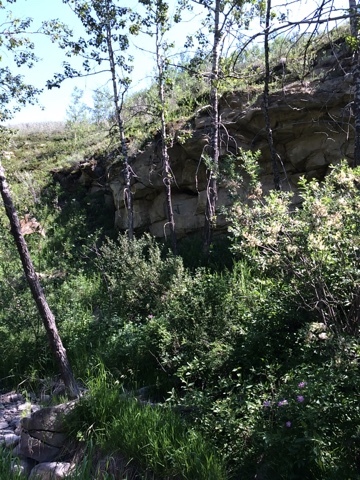 12 Mile Coulee - Some welcome shade on a hot day. We started near the north end and headed south following the paths, with cameras at the ready. I could hear frogs croaking, but did not see any. There lots of butterflies and a few dragonflies as well. 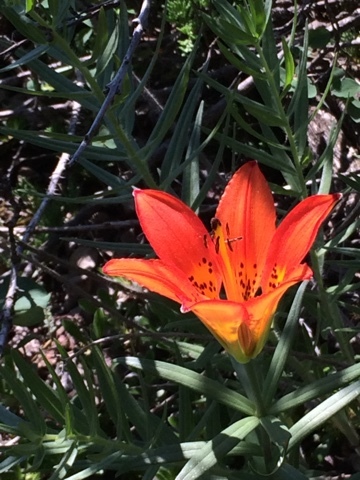 I was excited to see lots of Tiger Lilies. It is important to watch where you are going! 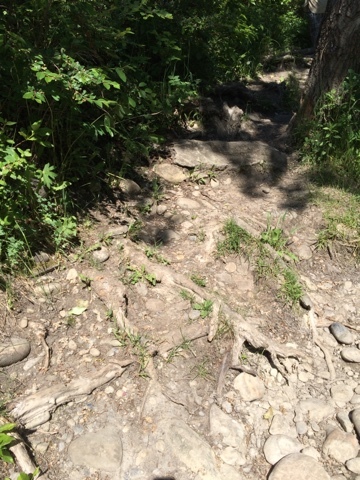 There are exposed roots and rocks along the bottom. It is tempting to look at plants and flowers and search for birds, but footing must not be ignored. 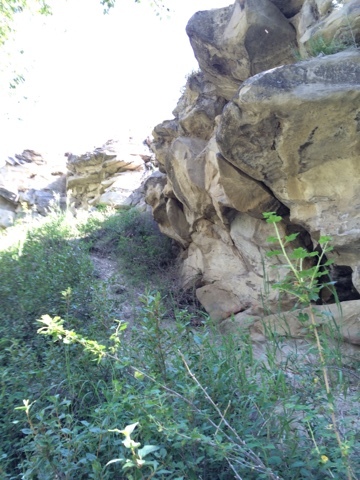 The sandstone outcroppings attracted our attention, and provided a shady spot for a break. This would be a good place to stop for lunch, if on a picnic. The plants and terrain was fascinating, making for a wonderful hike. The trails are narrow and we met a few other hikers. I saw plenty of mountain bike tracks, but no bikers on this day. 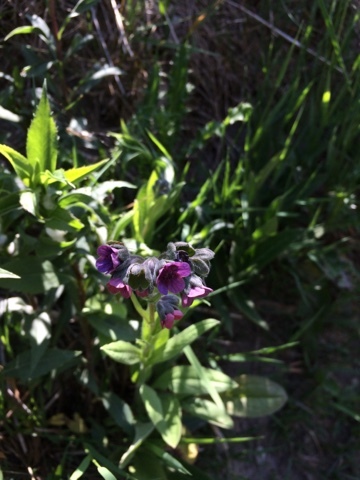 The wildflowers along the trail were really stunning. 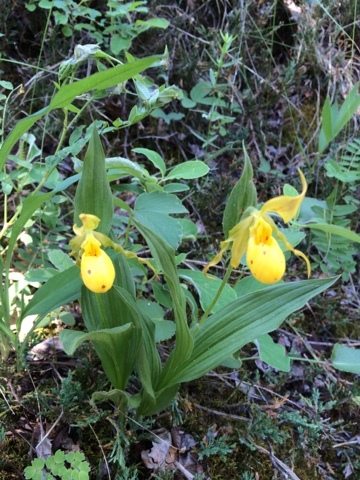 I didn't take pictures of all of them, (it would have added another hour or so to get pictures of each) I have never before seen Lady's Slippers in bloom. There are several different Native American myths about the Lady's Slippers, Here is a nice one. 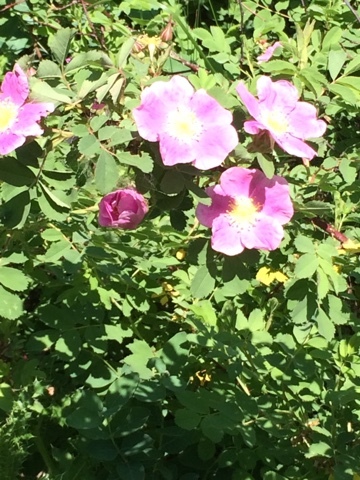 Wild roses, Alberta's provincial flower, were blooming on the valley sides. There were so many you could smell them before you could see them. 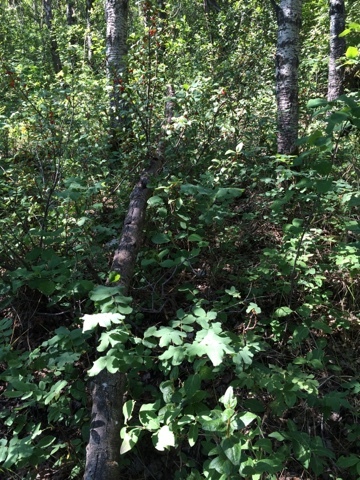 I was surprised to come across some Wild Saskatoon Berry shrubs. 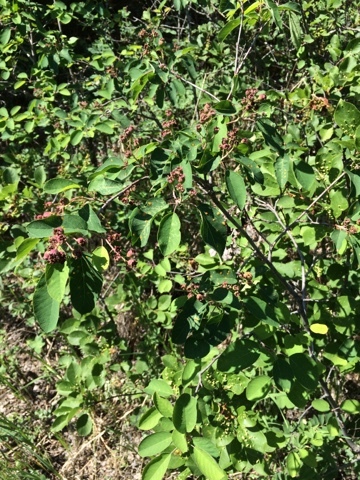 The berries are not ripe yet, but they look promising!